"My grandfather, whose name was Jacob Bartman, came to the United States from Warsaw, Poland in the early 1890's. He settled in Providence, R. I., where my mother and uncle grew up. 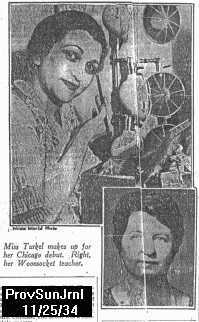 My grandfather was very proud of a cousin named Anna Turkel, who was an opera singer in the 1930's. He was so proud of her that he kept newsclips about her in a scrapbook, which I now have. I am enclosing copies of them for you. Turkel isn't a common name, so perhaps we are related. My mother thinks that my grandfather's mother in Warsaw was a sister of Anna Turkel's mother, but we're not sure. If this is the connection, and you or someone else you know is related to me, I have portraits of my greatgrandmother, greatgrandfather and a great-uncle. My mother says she visited the Turkels on Riverside Drive in New York in the mid '20's. Does any of this give you enough information to connect us to the Turkels?" apartment commanding a sweeping view of the Hudson River. how an opera star is made. exercises  And I remained with her for seven years, until I was 17.
my own. I've been on my own ever since, except for one year." Cesare Sturani. "Can this girl sing?" he asked. all night until the notices came out in the papers. Then I cried more. helped me turn down the contracts. put the $500 into the bank to live on until I could get a job. sang lead roles in Genoa, Malta, Cairo, Alexandria. "When I was ready to come home, I came home. My manager met me at the pier. said: "My dear, it is a question now only of the terms." He is a sweet man." of an opera singer?" she was asked. the old days before she was an opera singer." of Woonsocket, and beside the same piano where Anna used to practice, Mrs.
Cavedon told the story of her favorite pupil. recent debut at Chicago was an event heralded throughout the country. look out you are too pretty." possibilities, but she never "lost her head" - nor her heart. sang in the school choruses, took part in school clubs and activities. well. She often sang in the synagogue choir. Italian. All these come useful in the career of a singer. tenor, and her accompanist was her faithful friend and teacher, Mrs.
Cavedon. The debut was a complete success. Metropolitan was still before her. of hearing the great singers of her day, and to fit herself to imitate them. the walls and admire her voice. relations were reasonably well-to-do and helped her with money. candy counter because 10 members of the club offered to pay for her lessons. 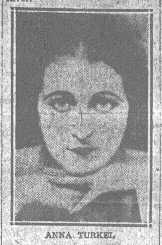 Names that were mentioned in this connection were Mrs. Frederick Brown, Mrs.
Ralph Jones, Jules Bache, Ludwig Vogelstein and Lewis Strauss of Newark, N.J.
might live at home. Her father had been a clothing merchant in Woonsocket. to her old teacher, "you would have been proud of your country bumpkin." title role of "Aida" in the Royal Opera House, Cairo. standing to seek her out and give her personal congratulations. her recent engagement with the Chicago Opera House. Anna's nearest relative who lives in Woonsocket is her mother's sister, Mrs.
as Mrs. Cavedon is for her pupil. They speak with great pride of her. skill of an accomplished mother. succeeded, perhaps they do not feel sorry. Anna has been traced on our family trees!